Here is the overview of upcoming and past events of the WiseGRID project. On December 13th, the 11th Conference on Renewable Energy will take place, a platform for the exchange of information and experiences with specialists from companies and associations for professionals in the sector. The project coordinator ETRA will share the project's experiences, strengths and difficulties with the audience. 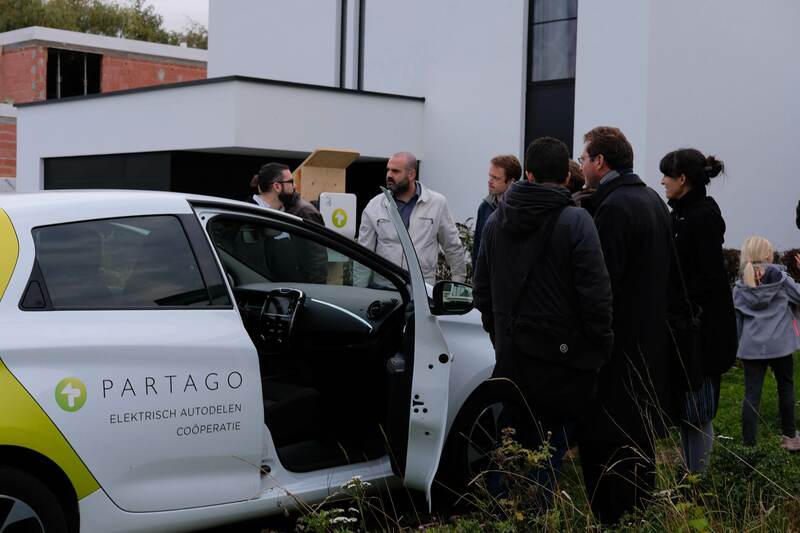 Every second Monday of the month, WiseGRID partner Partago organises a meeting in a neighbourhood in Ghent to bring citizens together to talk about sustainable mobility, clean air, renewable energy and much more. Access is free and everybody is welcome. However, registration of your planned attendance is appreciated. For more information & registration visit the website of Partago. 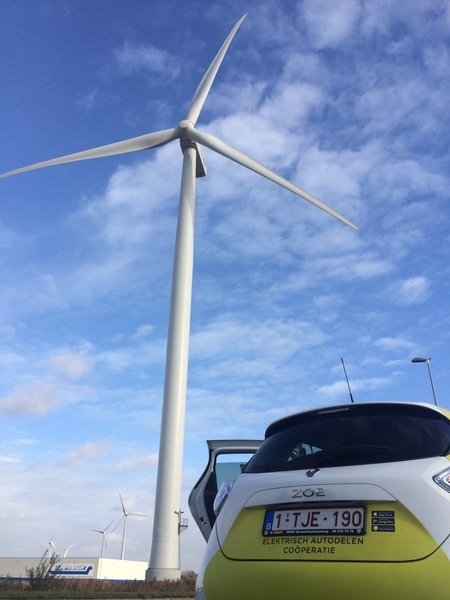 WiseGRID will be presented at the 2nd international Forum ‘Smart Grids for Smart Cities’ organised by EEE Smart Grid and hosted at EnergyVille (Genk, Belgium) 26-28 November 2018. Worldwide, the convergence of data and energy infrastructures is used to enable a better life for the citizens in smart cities. Smart grids show to be a real enabler of such cities, by integrating a high penetration of renewable energy, facilitating electric transport, allowing smart buildings and increasing the involvement of the end-user in the energy scene; altogether creating a sustainable lifestyle for the eco-aware 21st century citizen. However, all these prospected transformations bring numerous challenges and opportunities, both at industrial and academic level. Project Coordinator ETRA ID will be presenting the WiseGRID project during the session: "New roles in the grid, customer engagements"? WiseGRID: Where do we stand and what have we learned so far? We are already in the middle of WiseGRID project and this year was full of positives achievements starting from 3 Awards, engaging in citizen engagement workshops to developing WiseGRID tools for pilot site participants. For this reason, we would like to invite you to participate in a short webinar to get more insights of the status and further goals of the project. The webinar will take place September 27th 10:30-12:00 Brussels time. Please contact us if you would like to join the webinar. We will give you the practical details. Citizen engagement workshop: Smarter systems. Empowered citizens. 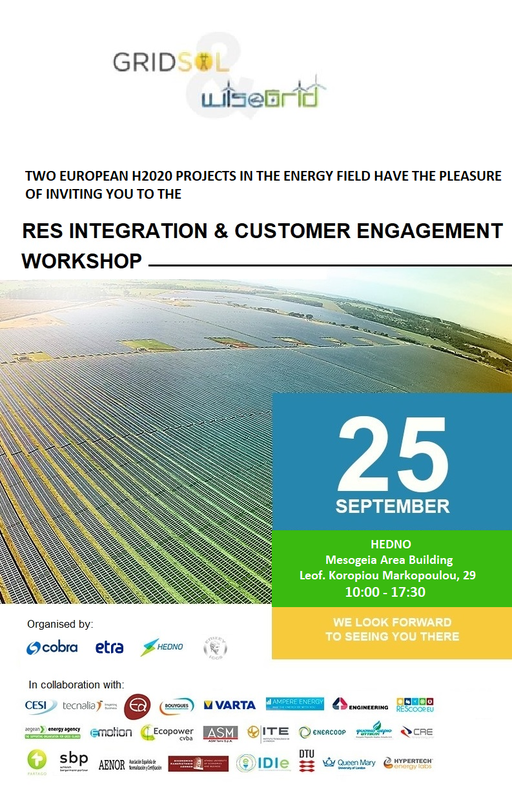 Two European H2020 projects in the energy field have the pleasure of inviting you to the RES Integration & Customer engagement workshop. The workshop organized by HEDNO in close cooperation with ICCS and ETRA will be performed on September 25th at the HEDNO premises in Mesogia area. The aim of the workshop is to give insights in both of the projects and to involve citizens in order to make them engaged to be part of the WiseGRID community. 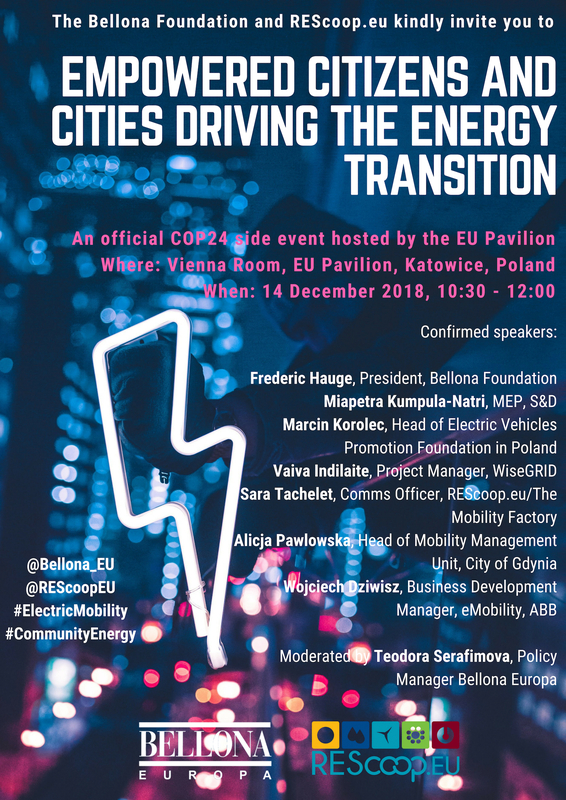 The European roadmap towards decarbonisation by 2050 is a challenge that requires the transformation process of the energy grid. This means commitment and efforts of all the related institutions, companies and citizens, towards the creation of an open market, which allows all the involved actors to play an active role for achieving a democratic global energy transition. The WiseGRID project is being developed following these key premises. Its main goals are to integrate, demonstrate and validate advanced ICT services and systems in the energy distribution network in order to provide safety, stability and flexibility to the Smart Grids, to reach an open European energy grid focused on citizens. 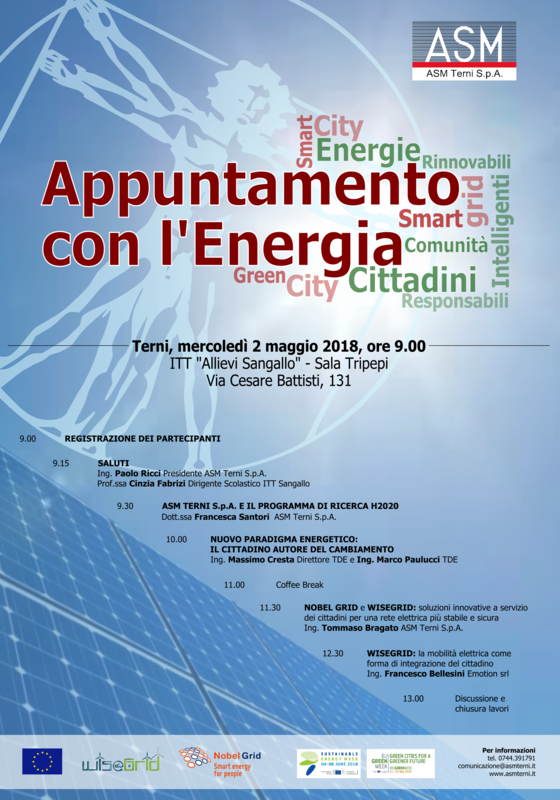 Workshop to explain and demonstrate the WiseGRID tools that will be deployed in Terni. Ulteriori informazioni possono essere trovate qui (italiano). Workshop to explain and demonstrate the WiseGRID tools that will be deployed in Kythnos. Περισσότερες πληροφορίες μπορείτε να βρείτε εδώ (Ελληνικά). On 11th & 12th of April, WiseGRID partners gathered together in Terni, one of the project's pilot sites, to discuss together the status of the project. In this meeting parallel sessions of technical and non-technical issues and two different WiseGRID tools were organised in order for all partners to be updated about each others progress. ASM Terni, the partner that hosted the consortium, gave a highly interesting tour in their premises. The partners were privileged to visit the ASM Terni buildings, including the operation control center, solar panel arrays, 2nd life Li-ion battery energy storage and four electric vehicle (EV) charging stations. The meeting was highly productive, enabling some important discussions that can push the project to the next level. The Romanian Energy Center (CRE) has represented Romania and the WiseGRID project in the exhibition of the 42nd edition of "MIDDLE EAST ELECTRICITY" organized on 5-8 March 2018 at the World Trade Center in Dubai. Please find CRE's communication on the GSES 2018 Exhibition here. WiseGRID will be present at the Best Practice Fair exchanging information with together with other best practices in different areas relevant to a renewables-based energy landscape. Participants will have the opportunity to hear new ideas, take inspiration from industry leaders and learn from the experience of existing initiatives. Presentation given by prof. Rafael Leal-Arcas, Queen Mary University of London, United Kingdom. WiseGRID was one of the favourite practices in the Good Practice of the Year Award in 2017 of the Renewables Grid Initiative in 2017. On the 29th of November, WiseGRID will participate in a webinar giving more information about the project. This H2020 funded project plans to develop solutions for a democratic and decentralized European energy system. You can listen to the recorded webinar here. On the 28th of November, Athens hosted SP1 WiseGRID meeting, where partners were gathered to work on WP3 - Architecture, data privacy and standards. HEDNO (Hellenic Electricity Distribution Network Operator) in cooperation with ICCS (Institute of Communication and Computer Systems) organised the meeting which took place at the National Technical University of Athens. The workshop while covering technical aspects needed to proceed with WiseGRID solution, also outlined the complex ecosystem created by the actors introduced by smart grids and the applications required for their participation in this emerging market. A summary of this event can be found here. Costas Kalogiros (AUEB) presented WiseGRID project to the Business Models working group of the BRIDGE initiative, focusing on its objectives, outputs and the business models. Furthermore, the challenges that prosumers face were discussed and recommendations to all relevant stakeholders were proposed, based on the recent WiseGrid workshop in Amsterdam. More information about the BRIDGE Business Models working group can be found here. To achieve the goals set in the Paris agreement countries need to ramp up their climate efforts significantly. One of the most significant tools is the decarbonization of the energy system. We already have proven and tested low-carbon solutions that have successfully cut emissions in the energy sector, and they bear significant scale-up potential in other countries too. Decarbonization of the energy system can be done, and countries can learn from each other’s achievements. Community Energy initiatives in particular, through increasing public acceptance, can play an important and accelerating role in decarbonizing our energy system. In a decentralized and smart energy system, together with renewable energy sources, new technologies such as e-mobility and charging infrastructure are gaining importance. As the nature of this distributed ecosystem poses serious challenges to the network, a coherent approach and level playing field for all energy actors is required. This event showcases two initiatives promoting the development and scaling up of low-carbon energy solutions: Nordic Green to Scale studies the potential of scaling up existing low-carbon solutions to countries in East Europe and East Africa, while the WiseGRID project aims to provide a harmonization between smarter systems and empowered citizens. More information about the Nordic Green to Scale project can be found here. Full EU Programme of Side Events can be found here. The Pavilion of the European Union will host a series of side events during the COP23 in Bonn, in order to stimulate the debate on key thematic areas, engage observers and facilitate the dialogue with party delegates and other participants. WiseGRID will be present in European Utility Week October 3-5, Amsterdam. The presentation of WiseGRID project and its tools during the third day of the conference October 5th. We organize a parallel event. For more information, check this page. 2. Panel "Society and Economy"
Summer Academy ‘Energy and the Environment,’ organised by Institute for Climate Protection, Energy and Mobility. The 14th annual Summer Academy ‘Energy and the Environment’ will show that further renewable energy expansion is still achievable, addressing the need to move beyond electricity and connect it with the heat and transport sector in a sustainable, smart energy system. The Academy features workshops, visits to a wind energy farm and a renewable electricity storage plant, a three-day conference program, and a social evening program, ending with a festive barbecue in Berlin. Flyer of the event can be found here. "Engineering, Technology & Innovation Management Beyond 2020: New Challenges, New Approaches". Energy Days are activities and events that raise awareness of energy efficiency and renewables. This event is a special session in Powertech2017 conference for NOBEL GRID & WISEGRID projects: Smart energy for European consumers. This conference that takes place between 18th and 22th of June, is a large gathering of international researchers and practitioners working in the general area of electrical power engineering within Europe. The recruitment workshop was held 2017/06/07 in Kythnos island with local citizens, WiseGRID project leaders and local municipality officials. The meeting included a small introduction to WiseGRID project, previous projects overview in the island, an introduction speech of the Mayor of the Island, a discussion session with local citizens and participants. The goal for this recruitment workshop was to raise awareness and recruit as much as possible people in order to bring more awareness to local pilot site in Kythnos. The event held initiated important discussions and main questions and emerged local participants to be involved in the project. This congress on Smart Cities on 26-27th of April, enhances the exchange of knowledge and experiences on Smart Cities in Spain, with the use of technology and innovation as the basis for its development tools. A conference about safe, sustainable and smart cities. It is a platform to exchange information and experiences within the sector. Organised by: University of Eastern Finland. The GENERA 2017 Innovation Gallery features 14 cutting-edge projects in the field of renewable energy and energy efficiency between 28 February and 3 March 2017 . WiseGRID created a poster exhibition called "A new energy model based on renewable energy, energy efficiency and intelligent electrical grids aimed at the end consumer.". WiseGRID attended the IX Conference on Renewable Energies, a platform for the exchange of information and experiences with specialists from companies and associations, for professionals in the sector. AMPERE gave a presentation called: "The new energy model: latest trends SXXI". This is the 13th edition of an open, plural and participatory forum that has become a benchmark for sustainability in Spain. WiseGRID attended the conference and a presentation about Smart Storage Systems was made by AMPERE. WiseGRID has a stand on the European Utility Week between 15th and 17th of November 2016. The European Utility Week gives opportunities to meet with experts from utilities, network operators, vendors, consultants, startups and system integrators covering the entire smart energy value chain.